The Labrador Retriever has held the spot of America’s most popular breed for 21 years straight. But in a surprise this year, the Rottweiler has moved into the top 10 displacing the Shih Tzu. 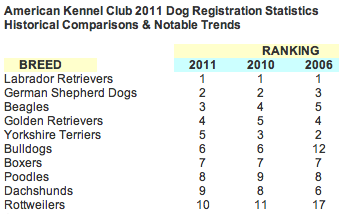 Check out the complete AKC Dog Registration Statistics for 2011 and see where your favorite breed lands. This entry was posted on Tuesday, February 28th, 2012 at 1:05 PM. It is filed under Blog. You can follow any responses to this entry through the RSS 2.0 feed.